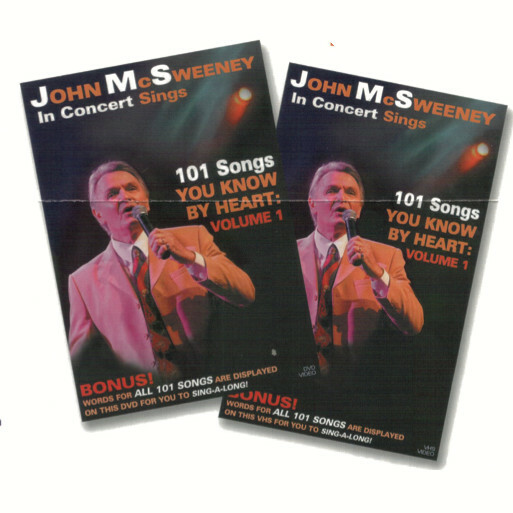 John McSweeney with his warm and engaging voice, presents 21 medleys of 101 well known songs. Shown in concert style, the dvd may be played with and without accompanying words up on the TV screen for a sing along session. Songs include: Shine on Harvest Moon, It’s a Long Way to Tipperary, There is a Tavern in the Town, Chattanooga Choo Choo, Carolina in the Morning, Dark Town Strutters Ball, Don’t Fence me In, Yes Sir Thats my Baby, Four Leaf Clover, Irene Goodnight, Put Another Log on the Fire and many more.